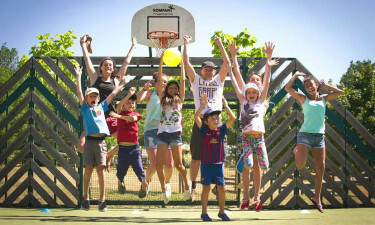 In a beautiful rural setting near the charming riverside village of Le Bugue in the Vézère valley, this LuxCamp holiday camping site sits in a lush wooded estate for a tranquil yet fun-filled stay for all ages. 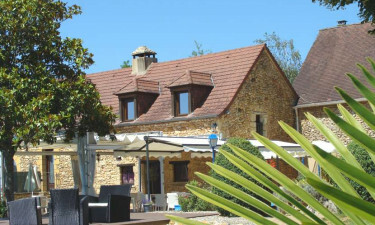 Offering some of the best luxury camping in the area, this site is favourably located near Sarlat and the fascinating prehistoric sites of the Vézère valley. The site amenities are extensive and include a restaurant-bar, snack bar, shop, water park, miniature golf, fitness trail, sports fields and a children’s club. Why choose a mobile home at Camping La Linotte? 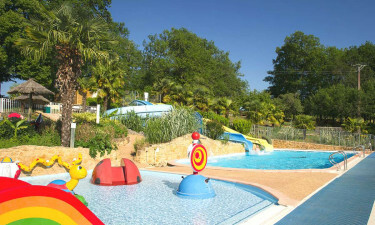 The aquatic park at Camping La Linotte is the site’s jewel in the crown. To ensure fun for all ages, its design is fabulous. All pools are heated throughout the season. There are two large pools: one with a slide, and a special play pool with slides for the little ones. This luxury camping site might be near a river, but a man-made beach is a great feature of the water park. A 190 square metre area of sand provides a lovely space to spread out a towel or to recline on a sun bed or deck chair under a parasol. Kids can dig holes and build sandcastles galore.